How hard can it be to take down an Internet powerhouse? This is what Google has been pondering about Facebook for some time now. On June 28th, they put months of speculation to rest and made it official by launching Google+. Now that I have seen it firsthand, I can agree with other reports that it is a lot like Facebook. It allows you to update your status, post pictures and share links like you are already used to. Supposedly they are also some features that make it attractive to enterprise users as well. So the question is this: Can Google paint a picture pretty enough to lure people away from Facebook? In my experience, most people are simply creatures of habit and tend to shy away from things that require a lot of change or relearning. With that said, I am willing to bet that as impressive as the service is, it’s definitely going to be an uphill climb for Google to pull this one off. To their credit, however, they have built an empire on giving users exactly what they want. The difference here though is that they are starting from scratch in an industry they have little experience in. Needless to say, they have a ways to go. If you remember it was just last summer when Facebook announced that the site had amassed 500 million members. This officially gave them the bragging rights of being the largest social media site in the world. While they haven’t released a more recent count, it is speculated that they are close to three-quarters of a billion users by now. Social media has come a long way. In the past year we’ve seen stories of the FBI using Facebook to catch wanted fugitives. We’ve seen victims of tsunamis, tornadoes, and various other disasters reach out and use the likes of Twitter and Facebook as lifelines to their loved ones.. and that hardly scratches the surface. In fact, every single day people log into Facebook and share intimate details of their latest beach trip, post videos of their silly pets, or upload pictures of their children in costumes. People love Facebook. It’s addicting. It keeps families in touch. It keeps friends in the loop. It’s the king of social media. With that said, it’s obvious why it’s going to be tough for Google to persuade people to add yet another website to their list of things to check each day. I doubt, in the short term anyway, that people are going to want to do away with Facebook altogether for Google+. It just doesn’t have enough critical mass yet. That lack of critical mass is (if I had to name anything) the biggest handicap for Google. As of now, the site is still in Beta and is invite-only. I had to ask around to get invited and now that I am there, I am pretty much alone. 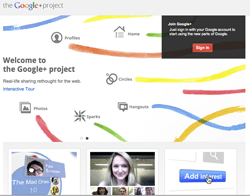 Who is going to sign up for Google+ when the site is practically empty? Social sites aren’t any fun without your friends and family. With that being said, there is some hope for Google.. Remember not too long ago, MySpace was the best and most popular social networking site. For the record, yours truly was never a MySpace member, I thought is was for kids, but the fact remains they were the reining king. Then along came Facebook and knocked it down, leaving behind only a shell. I guess time will tell if people are going to have time or patience for yet another social network. But I will say this: If I had to name one company that has the talent (and money) to take Facebook head on, I’d put my money on Google. Paid Social Media: Which Platform Should You Use? Though his chief ambition is to one day control the entire Internet, Jim busies himself in the meantime running our little web development and marketing agency. He's a certified super nerd who ranks coding in old, outdated languages and watching Star Trek reruns just a bit too high on his list of fun things to do.Outside of work, Jim enjoys Hockey (Tampa Bay Lighning, to be specific), more genres of music than most people realize exist, riding his Harley (he calls it "two wheel therapy") and exploring the world through travel.